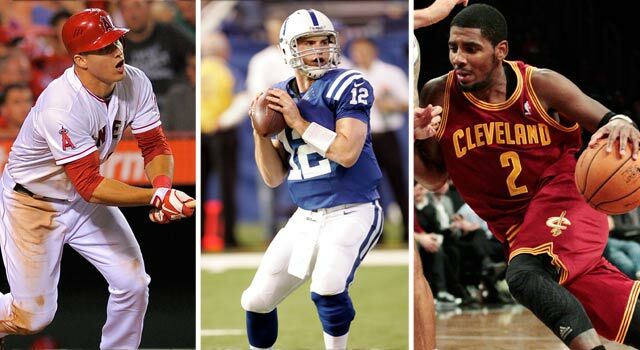 Best rookie season: Mike Trout or Andrew Luck? Published: Jan. 4, 2013 at 03:34 p.m. Updated: Jan. 4, 2013 at 04:22 p.m.
Get ready to hear this a lot this weekend, but in any other year, Alfred Morris would be the runaway rookie of the year in the NFL. In fact, I feel like I've written such a thing about 36 times in the last three days. There are actually a handful of guys in the NFL you could lay the same claim. Doug Martin, Luke Kuechly, Chandler Jones and Trent Richardson are a few more who won't even get but a cursory look as the top rookie. And it's not just football, either. If you take a look at all of the professional sports, rookies have dominated the headlines with amazing plays, unbelievable catches and some even made a bid for their league's most valuable player. But who was the best rookie for the year 2012? Let's take a look. All due respect to Calder Memorial Trophy winner Gabriel Landeskog, but he didn't make it. The Cleveland Cavaliers were desperate for a superstar after, you know. And they have a pretty good one in Irving. He was good, and the future is bright for the Cavs again. But he's not going to rank much higher on this list against guys who have put up all-time numbers. Harper has been seen as a baseball prodigy as he grew up in Las Vegas. The Nationals made him the first overall selection in 2010, and he made the big club last season to help lead Washington to the postseason. His only downfall was a .130 batting average in the playoffs. Wow, does this make Morris the third-best rookie in D.C.? RG3 might be easily the most talked-about NFL rookies in recent memory. Griffin beat opponents not only with his legs; he posted a rookie record 102.4 passer rating. He even showed in the last few weeks even on one leg, he's still better than a lot of veteran quarterbacks. Well, at least better than Tony Romo. The Colts were 2-14 in 2011 and looked outmatched in most games. Luck not only led the Colts to respectability, he led them back to the playoffs. Luck set a rookie record with 4,374 passing yards, seven winning drives and set a rookie record with 433 passing yards in Week 9. Should be considered for MVP, but will have to settle for ROY. Forget about comparing Trout to other rookies, he did something unprecedented in the history of baseball when he hit 30 home runs, stole 45 bases and scored 125 runs in a single season. He also flashed the leather in the outfield, too. His WAR (have a baseball fan explain it to you) was through the roof. The only people who didn't feel Trout was the MVP were the curmudgeons who cover the sport and Tigers fans. Normally, I get some disagreement on the Pick Six. But I feel nobody could argue against Trout here. But I guess if you have a comment, you can hit me up via Twitter or via Facebook Also be sure to catch the latest on the Dave Dameshek Football Program.